It's been ten years (!) since we graduated from college and got married and I have kept a fairly detailed book journal all ten years. I am in full nostalgia mode and recently looked back to see what I was reading during our first year of marriage. My past self was adorable really – so earnest and serious. The subsequent years and being married to Telfer have given me a better sense of humor and a lightened outlook but I so enjoyed reading about our first year of marriage intertwined with the books I was reading. We packed a lot in during that first year. We graduated from college and three weeks later we got married. We honeymooned in Seattle and the San Juans. We lived with our parents for about a month. We drove the U-Haul to Southern California listening to our first audiobook, From the Corner of His Eye by Dean Koonz (so awesome, thank you Chris, we still talk about Junior Cain every once in awhile). Our new apartment, rented sight unseen, was on a semi-scary street with a giant cactus and had red carpet. We loved it. It was so hot and we were too poor to turn on the air conditioning. Telfer didn't start medical school for a month and I didn't have a job yet so we sat around reading. Reading is so cheap compared to almost everything else. I got a truly horrific job as a secretary at the Pool & Spa Outlet in Loma Linda. This says it all: the boss was having an affair with a twenty-year-old girl in the office and from what I hear, a few years ago ordered a Russian bride! NNU didn't quite prepare me for that! Good stuff. I read every spare moment to distract me from the knowledge that oh, this is my post-college life! Welcome! I quickly decided to go to graduate school and become a librarian. I quit my job and started graduate school in January. Telfer was eerily good at medical school. He would always want to watch a movie the night I had a twenty-page paper to write. We read and studied together in our apartment and "donated" plasma on Friday afternoons so we would have $40 in play money for the weekend. We went to the library a lot. One Saturday every month the library in Redlands had a book sale where you could fill a paper bag full of books for $3.00. Such good memories, all of it. Middlemarch | George Eliot | After four years of reading what I was told, it was so liberating to read whatever I wanted. I have great memories of reading Middlemarch in the first month or so we were married. On our honeymoon, sweating in our apartment. Dorothea Brooke is a heroine I really want to revisit. A Wrinkle in Time | Madeline L'Engle | I hated this book when I had to read it in sixth grade but I reread A Wrinkle in Time at the Griffith lake house before we moved to California. My sophisticated, college-gradaute self couldn't believe her sixth grade version. Now I just smile. Different books for different seasons, right? The Virginia Woolf Reader | I bought and read this on our HONEYMOON. Nice, light reading, eh? To the Lighthouse | Virginia Woolf | I love this perfect novel. 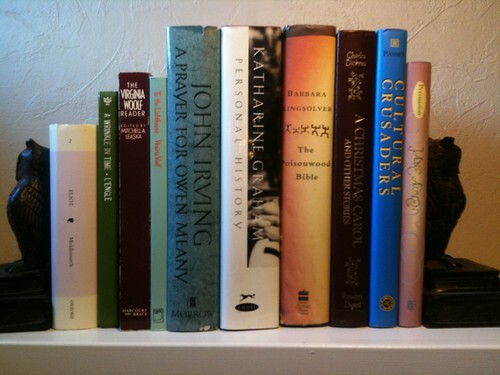 A Prayer for Owen Meany | John Irving | A guy named Marcus in my senior english seminar said this was his favorite book. So I put it on my list and scored the book in a $3.00 library bag. I think you either hate or love John Irving. Well, some of his novels are really terrible but A Prayer for Owen Meany is a beautiful thing. Personal History | Katharine Graham | You don't read books like this in college and I am not sure why I picked it up. I had never read an autobiography like this before (the junior biographies of Narcissa Whitman don't count – I was obsessed with the Whitman massacre as a child) – an educated woman in a horrific marriage who finally takes over the family business (The Washington Post). The Poisonwood Bible | Barbara Kingsolver | This novel blew my mind when I read it. It would be interesting to read it again. Nathan Price, his wife and four daughters go to Africa as missionaries in the 1950s. It does not go well. The writing is sublime. A Christmas Carol | Charles Dickens | I had never read A Christmas Carol until the first Christmas we were married. Now Christmas is not Christmas unless I have read it. Cultural Crusaders: Women Librarians in the American West, 1900-1917 | Joanna Passet | Library school was, how shall I say it? Something I was blessed to be able to do but not exactly the most rigorous experience of my life. Lots of people complaining about writing papers. So exhausting. Just write them already! This was the best book I read in two years of library school and I think the only one I kept. Persuasion | Jane Austen | I had read Sense & Sensibility and Pride & Prejudice in college and of course loved them but when I read Peruasion, during the first Fall we were married, I knew I had found my favorite Austen. Sigh. I wanted to name one of our girls Elliott Anne. Don't worry, we will not have a third child. Can you even imagine what a third pregnancy would unleash? But you know it would be a girl if we did. I’m with rachelle, fun to read through those memories. I had somehow managed to forget your spa job. However, I will always think fondly of your first apartment and for some reason I thought you got way more money for your plasma…good memories indeed. And I think in your first year of marriage Telfer decided that Pride and Prejudice was his favorite book – right?